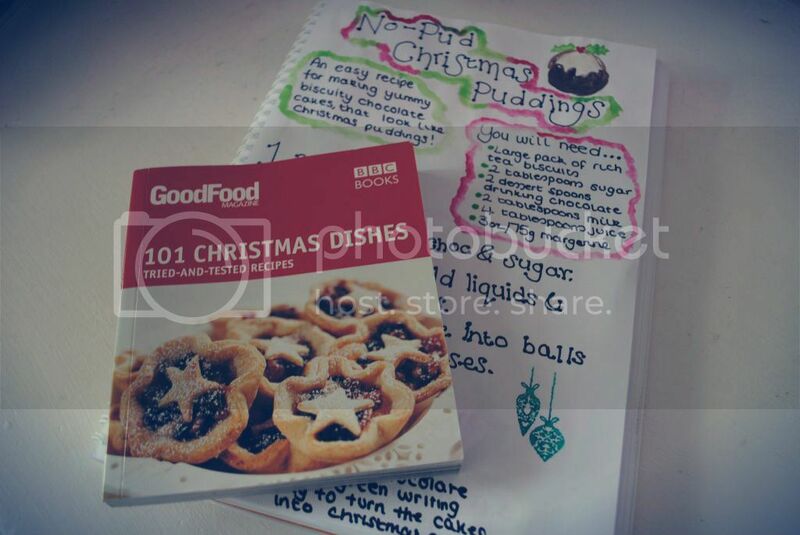 If you read my blog at the start of the month you'll know that I'm taking part in a Christmas Scrapbooking Project with Getting Personal, where I'll share with you Christmas gift ideas, recipes, crafts etc. 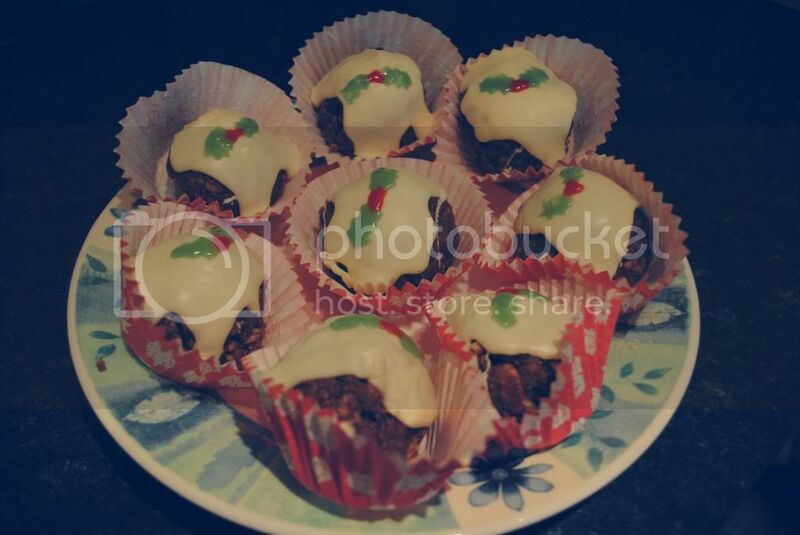 In this post I have a couple of really simple recipes and decoration ideas for you. Enjoy! First up, a really simple yet delicious recipe for cute Chocolate Christmas Puddings, perfect if you're not a fan of traditional Christmas puds (or you're just a chocoholic, like me!). Once you have everything you need, simply break up the biscuits (I usually keep them in the packet and bash it with a rolling pin - gets your anger out and is very effective! ), and then add the drinking chocolate and sugar. Then melt the margarine in a saucepan and add it to the mixture, adding the rest of the liquids (milk, juice) and stirring them all up to a nice, moist consistency. If the mixture is a bit dry, just add more milk/juice. 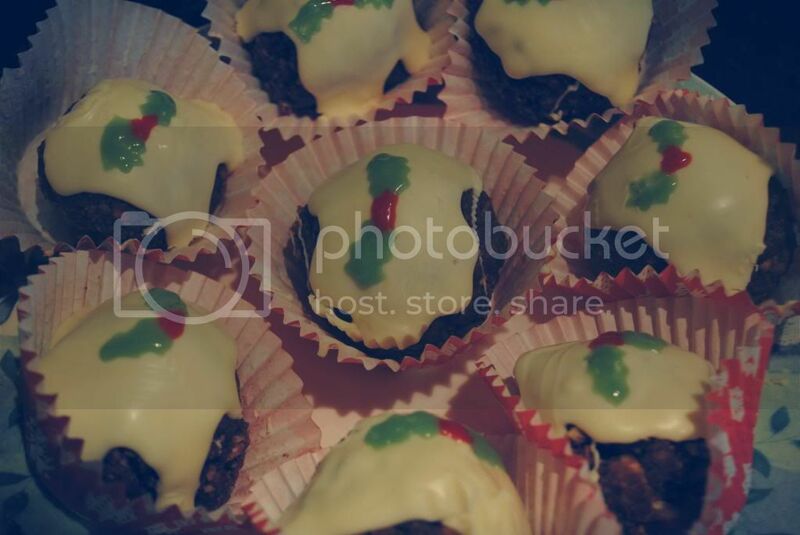 Then separate the mixture into ball shapes and put them in (festive) cake cases. Then all you need to do is pop them in the fridge to set, and then it's time to decorate! I melted down a big bar of white chocolate (Milkybar - yum!) and then evenly distributed (basically, I 'plopped' it on) it on each cake. Then I put it back in the fridge to set, and once it was ready I used red and green writing icing to draw on the holly. Voila! These hanging Christmas decorations will look perfect hung on the christmas tree, or door handles etc., and they're so simple to make. Simply stencil out your shape twice onto your chosen fabric, cut out and sew them together, leaving a gap for the stuffing. 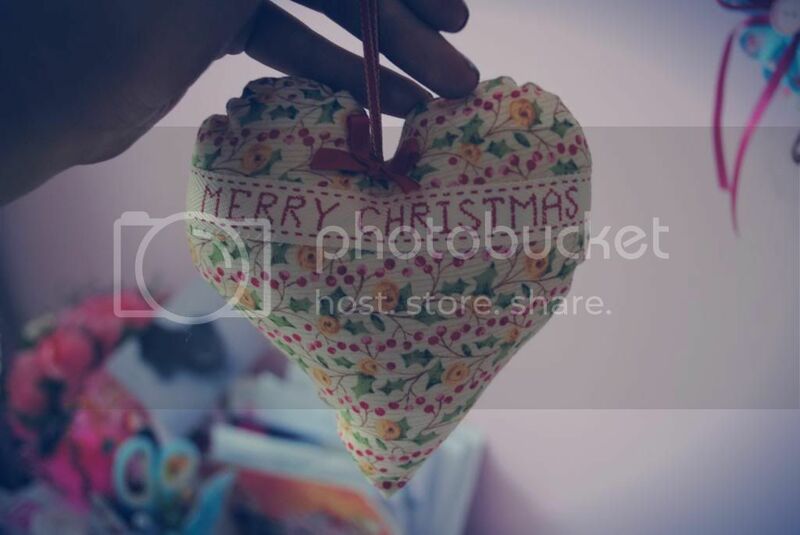 Then fill the shape with stuffing, sew it up and add your embellishments - not forgetting the ribbon to hang it up with! Buttons and sequins look great, or you can get 'Merry Christmas' ribbons and sew them across the front. It's good to just have a play around and see what looks good - and experiment with your shapes! 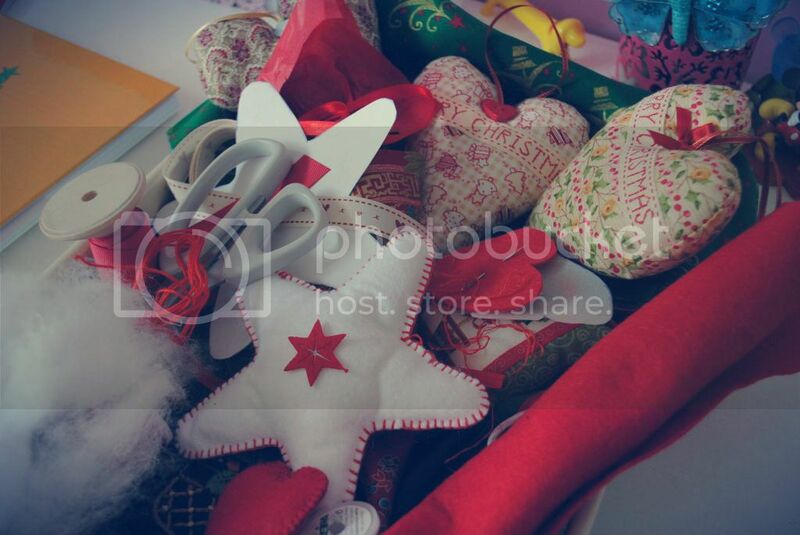 You can make stars, hearts, or even christmas tree shapes. Have fun! 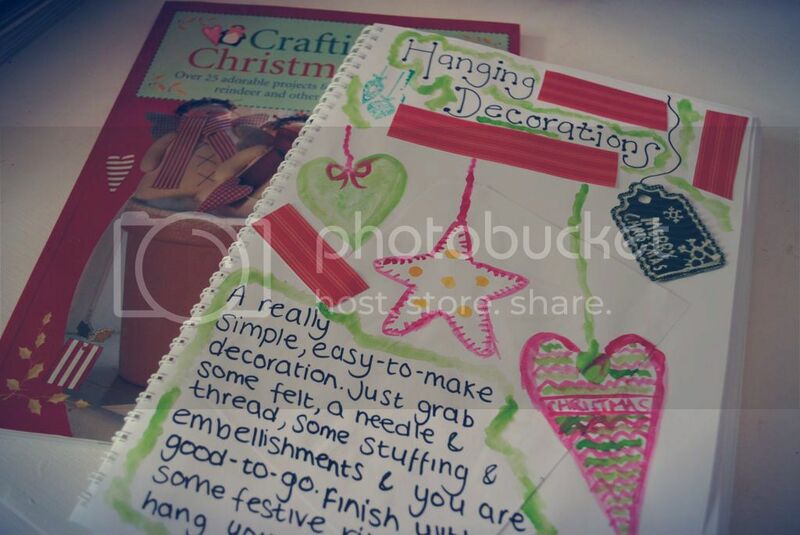 Look out for my final post of the scrapbooking project next week - I'll hopefully be doing some Christmas present ideas and trying my hand at cardmaking.